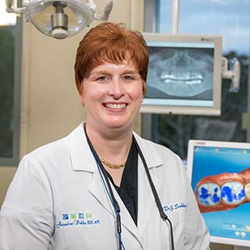 To raise awareness of the links between heart disease and gum disease, Dr. Jacqueline Subka uses American Heart Month to talk about advanced laser therapy options for patients with chronic periodontal disease, including bleeding gums in Thousand Oaks, CA. During American Heart Month, Dr. Jacqueline Subka raises awareness of the harmful effect untreated gum disease can have on the heart. Warning her community of this connection, she advises anyone with common symptoms of gum disease, such as swollen or bleeding gums in the Thousand Oaks, CA area, to receive a consultation. Dr. Subka is inviting people throughout the region to make appointments to discuss their dental issues. Her goal is to help those with gum disease “red flags” such as inflamed gums, persistent bad breath, and mouth sores, to learn the best ways to manage the underlying problem. One such way is through modern, safe, effective laser therapy. Lasers have become the gold standard in care for all stages of gum disease, from reversing very early gingivitis to keeping periodontitis from spreading. Treating gum disease is not just good for the mouth, but for the whole body—especially the heart. Research has shown a strong link between people with periodontal disease and heart disease. It is thought that former condition exacerbates the latter one by releasing bacteria into the bloodstream. The bacteria cause inflammation and other issues, forcing the heart to work less efficiently. For people with already existing heart disease, the need for constant monitoring and treatment of their oral health becomes even more essential. Patients who have experienced issues like bad breath or bleeding gums in Thousand Oaks, CA, can reach Dr. Subka for a complimentary consultation at 805-373-1919 in a comfortable, judgment-free setting.